7: What's in a Name? Neighborhoods are full of names. Names of streets and parks and alleys and buildings. A lot of times, the things or people those neighborhoods are named after are long gone. Whiskey Island, near downtown Cleveland - the distillery is all dried up. The Shakers of Shaker Heights? That strange, celibate religious sect - of people who shook with devotion when they worshipped - died off in the 1800s. Today, we know the names — but only as landmarks. Ryan Easter is different. See, Luke Easter Park is in his neighborhood, but it’s also in his family tree. Luke Easter, his grandfather, was one of the first African Americans ever to join a major league baseball team. 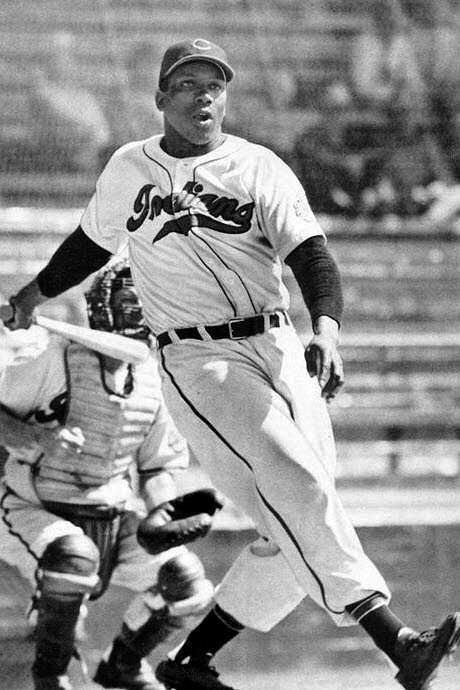 He was famous back in the 1950s and 60s for hitting so many homeruns for the Cleveland Indians that they got their own nickname — Easter Eggs. He bought a house in Mount Pleasant back in the 1940s, when it was a nice, leafy neighborhood with good schools. Where kids played ball and jumped rope in the tidy streets. Luke’s grandson, Ryan Easter, still lives in that same house today — but not for long. Neighborhood roots. What does it mean to have them? What kind of responsibility does the past give you to the present? And how do you weigh that against what you need to do to take care of your own future? One of the first things you notice about Ryan Easter is that he’s really tall: 6’5". When he’s playing a keyboard or working on a computer — which he does a lot for his job — he has to hunch himself in half to get in range of the equipment. When I meet him at the Boys & Girls Club on Broadway Avenue, he’s working with a 16-year-old named Keith to make beats on some computer software. That’s what Ryan does for a living these days: teaches kids about recording music. He works for a national nonprofit program called Notes 4 Notes, which is all about helping kids express themselves through recording their own songs. Ryan’s the Cleveland regional director. "What I’ve learned to do is let them work on their own," he says. "I taught them the software and they play guitars and sing songs. So i kinda let them go in there and create." For Ryan, music’s been his main passion for decades. But it wasn’t always that way. When he was really young, growing up off Kinsman Road in Mount Pleasant, he thought he might enter the family business. He’d spend hours in his backyard, practicing his swing. His grandfather was already gone by then. But Ryan had another coach. "My grandmother would save pop can tops. You know, the tabs," he remembers. "She was like, 'Every morning you’re going to wake up and hit these at 7 in the morning.' And then all the sudden I could hit everything." Ryan grew up knowing he was related to someone important: a real, major league baseball star. The guy who held the record for the longest home run ever hit at the old Cleveland Municipal Stadium. And sometimes, that came with benefits. "There was a pizza guy one time who owned a pizza place," he says. "Every time I would go and get a pizza he’d say, 'I can’t charge you, because your grandfather when I was little used to send me and 100 friends to the game with ice cream and sign autographs and stuff like that.'" Ryan remembers who Luke is, of course, and some Clevelanders still do too. But a lot has changed since he was swatting dingers over the fence. When Ryan was a kid in the 80s, Kinsman Road and Mount Pleasant were pretty close-knit. There were stores you could walk to, neighbors you knew. "But around '92 or '93, that’s when you could feel things change," he says. "I think you could notice the drugs taking a toll on people’s families. You could see people’s posture, literally their physical posture would be different over time." It became more and more apparent that the Easters — even though they weren’t rich — they were different from a lot of their neighbors. So like a lot of families, when they start feeling out of place in a nabe that starts “changing," Ryan and his mom and grandmother tried moving. Out to the suburbs. "It was a nice house," he says. "It wasn’t new but it had a lot of new stuff in it. So we moved out there and it was so quiet that it was annoying. We packed our stuff and moved right back to Kinsman." But then around high school, Ryan started to lose his way. His grades started getting bad enough that his school didn’t let him play sports anymore. He gave up on baseball and started holing up in his bedroom. Doing that teenage thing of putting up blankets over the windows to block the sun, being sullen and withdrawn. Meanwhile, outside those windows, it felt like Mount Pleasant was falling apart too. By 1990, the population was just over half what it had been in 1940. More than one in 10 houses were vacant. Ryan graduated and got out. He went to Youngstown State University, where he spent a year skipping classes and goofing off. Then, a friend who worked in a recording studio introduced him to something that finally got him excited. He’d always liked music, like most teenagers, but making it? That was different. That gave him something he’d been looking for without knowing what it was. "I love that you can do what you want and if it’s right to you then it’s right you know," he says. "If you want to have a chord and put two chords in there that’s your business. I appreciate the freedom of that." Ryan saved up some money, bought his own computer, spent hours at a time slaving over the software. He got an early break one day when he sold some beats to a local producer for a cool two and a half grand. For a 19-year-old, it was a ton. "I had class on the Monday after that, and I like dropped out of school," he says. "I’m like, 'I’m not going to school anymore, because i just made $2,500 off of some beats I didn’t even think were that good." Ryan kept hoping one of his beats would land in a song by a big name artist — Mos Def or Kanye. He’d fly out to LA and down to Atlanta trying to get in the door with someone who could give him a big break. But it just seemed like it wasn’t happening. He’d get interest from someone’s people, then nothing. Eventually, he went back to college, got his associates degree. And then his daughter was born. Having a kid is what really made him start to think about life differently. "I’m going to keep doing music but I’m gonna do something else as well," he says. "With having a child, I want to make sure i maintain her level of life you know. like a healthy decent level of life." So one day, he was driving past the Boys and Girls Club in Cleveland, and he had a thought. The kids in there — they needed music. Just like he’d needed it, when he was young and looking for a sense of purpose. That was a few years ago, and he's been working with Notes 4 Notes at the Boys and Girls Club ever since. "It surprises me how intimate it is but I love it," he says. "Like I was actually created for this." He finds it easy to connect with the kids because of his own background in Mount Pleasant. "I grew up in a neighborhood that’s bad where I had things, where people always came to us for things," he says. "But I was best friends with people who didn’t have anything. So I see these kids and I’m like, 'That’s so and so, from when I was little.'" At the same time Ryan’s feeling that connection with the Mount Pleasant of his youth, he’s preparing to move out. He’s planning on renting his house off Kinsman and finding a place out in the suburbs, closer to where his daughter goes to school and lives part-time with her mom. And this time, he’s not worried about birds chirping and quiet. "Noooo," he says. "I have lived through enough gun shots and sirens and seen people get shot and killed like in front of me. That moment in time is played out for a 38-year-old guy with a 6-year-old daughter." Given his roots in the neighborhood, I ask if it's a hard decision to leave. "No," he answers without hesitation. "It’s a safety decision to leave. Like my child — I don’t let her outside in the front yard or the back yard. So I tell my friends all the time, when they speak of me moving, 'I have served my time to the hood.'" He says he has no loyalty to neighborhoods — and he doesn't understand people who do. "People get tattoos of their street or T-shirts — that stuff doesn’t make sense any sense to me," he says. "You don’t own the whole street. I don’t own Kinsman, so I have no loyalty to it. I have a loyalty to my child and I have a loyalty to my family to not get killed." So for now at least, the Easters of Mount Pleasant look like they’ll be going the way of the Whiskey on Whiskey Island and the Shakers of Shaker Heights. A memory that some will remember, and some will forget. And maybe that’s OK. Maybe the future of the neighborhood is in the hands of someone living there right now. A kid, or an older woman or man — whose name we just don’t know yet.